Rocking his possessed acid-loving pants, D. Gookin (a.k.a. Mike Birnbaum) creates some wild tracks. 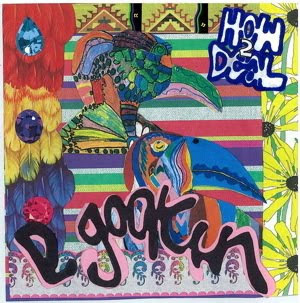 His LP How 2 Deal features a mind-bending array of influences. With a drum kit, synthesizers, and breathy vocals, this New Haven-based artist channels straight '80s vibes. But between the space-age fades, smooth lady samples, and the '70s flute of disco classics, it's clear D isn't afraid to throw random ingredients in the blender. Just when you think you've figured D out, he switches his game up. On the long intro to "Embrace," D interviews his mom about "standard procedures that should be practiced for certain messy situations." From spilling coffee to eating Cheerios out of a bowl, this stain-centric interview drives home an important moral: it's always important to have at least 20 clean rags. As the track fades into a glockenspiel and static crackle, you're left wondering, "Did that just happen?" I actually saw D a couple weeks ago when he opened for Body Language and Neon Indian at the Wadsworth. He did a great job of warming up the crowd, but he also left a good impression. After blazing through tracks of his own, he finished off the set with a cover of "1979." No matter the music, Mike always looks like he's having a good time. Catch him Thursday with Juiceboxxx in West Haven or give his album a listen here.